The merging of great artwork and an excellent story is clearly present in FutureDude’s inaugural edition of Brainstorm. Based on a story conceived by Jeffrey Morris and his sons, Kieren and Ian Morris, and written by Jeffrey Morris and Ira Livingston IV, Brainstorm delves into the very tangible science of controlling an uncontrollable force, in this case weather, and attempting to use it for military purposes. 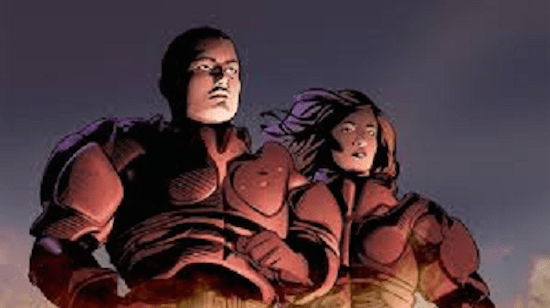 The story centers on Cale Issacs, the leader of a team of scientists that have developed a system, named Zephyr, to combat the changes in the weather system caused by the ever-changing effects of global warming. By shooting a missile containing nanites into the vortex of a storm, the scientists are able to control the strength of the storm, or even stop it, by using a neurological connection to the nanites. Unfortunately, the military hijacks Zephyr from Cale and his team to weaponize the system. Locked out of their own project the scientists return to Miami, except for Cale, who decides to return of to Wyoming, where he is estranged by his family. Upon his arrival, he is greeted warmly by his mother, and coldly by his brother Cole. The resentment that Cole has towards his brother runs deep. And Cole’s return home opens up old wounds in regards to his family and those who stole his life’s work. In the meantime, the military has deployed Zephyr into a tropical storm off the eastern seaboard. Their attempts to control the storm succeed, changing it from a mild tropical depression into a full blown hurricane. But as the storm progresses, it develops a life of its own, and the military loses all control. The storm increases in size and intensity, threatening catastrophic destruction and death to the entire Eastern coast. Brainstorm is one of those rare finds in comics for me-the developers have created an insatiable desire for the reader to get to the next chapter of the story. The story, by Morris and Livingston, is totally engrossing from page one. They have established characters fairly quickly, and have delved into what will be the primary crisis throughout, and have left the reader with a humdinger of a cliff-hanger. And speaking of establishing the characters, the developers of Brainstorm have done a great job at bringing each of the characters to life. There are very subtle moments on the page and in the dialog that provides insights into those involved. These moments definitely make those involved in the story more current and ultimately, more universal. There are supporting characters involved in the story, including a pair of television storm chasers named the “’Nado Ninjas” and a television Meteorologist, that become more involved as the story progresses. 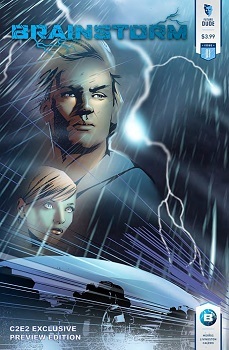 The artwork, by Dennis Calero, gives the comic an almost cinematic feel. The opening sequence, during a F5 tornado in Oklahoma, has that excitement that occurred the first time you saw the tornado in the film Twister. References to Devil’s Tower in Wyoming make the name Spielberg pop into your head. The action that occurs on the pages makes you wonder what it would look like on the big screen. Calero stays primarily in a darker, warmer color scheme, only brightening up in some of the story’s lighter moments. Like I said, it takes a lot to get me involved with a comic series, but Brainstorm has definitely hit home. It has everything: an incredibly topical story that is only going to get better, artwork that pulls you into the story, and characters that you can identify with and root for. Jeffrey Morris and Ira Livingston have created a realistic story of scientists developing technology, only to be corrupted by the military. The first issue of Brainstorm will be available in August. Trust me, it is definitely worth the wait.